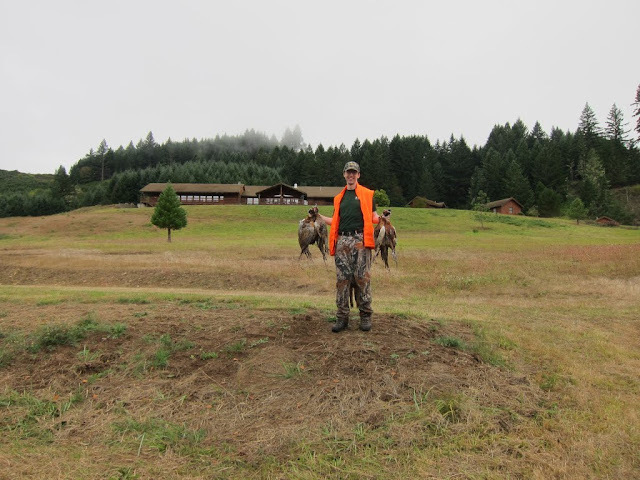 When I booked my trip to Big K for the rifle class, the opportunity to hunt Blacktail presented itself, and I was very excited to fulfill a desire several years in the making. The guided pheasant hunt was sort of an afterthought… I was going to be there, they offered pheasant hunts, so why not? What a mistake passing it up would have been! Okay you got me, that’s actually “Duck Hunt” for the NES, but it’s fairly similar, the dog stirs the bird, you shoot it with a shotgun, and the dog fetches the bird. There are differences with the video game, namely upland game hunting is much more exciting and you get to eat the end result. The property we hunted is a bird preserve owned by the Big K. They have planted hundreds of acres of sorghum, japanese millet, corn, and other food sources and shelter for game species like Pheasant, Quail, and Chukar. While the ranch lets people bring their own gun dog, as I knew nothing about pheasant and even less about dog handling, I called in a professional: Steve Waller. This guy eats, sleeps, and breathes dogs. He’s one of the only “Pudelpointer” breeders/trainers in the pacific northwest. The Pudlepointer is a 125 year old cross between the english pointer and german poodle (pudle). In Steve’s words, it’s got the excellent hunting instincts of the pointer and the intelligence of a poodle. As if to emphasize the importance of the dog to Steve, after I was handed the loaded Mossberg 500 and we were walking with Keeper (our gun dog) down to the hunting area, he said quite earnestly, “I wouldn’t take 10 grand for that dog.” The time and energy he puts into training and breeding the dogs was quite remarkable. This routine continued pretty fast and furious. I shot the six of the first seven roosters we flushed. For a first-time hunter, and non-shotgun person, I was VERY pleased. The one I let get away, I forgot to to disengage the safety, doh! As we shot more roosters, Steve gave me some good pointers. I jumped a bird, and immediately mounted the gun and drilled him from about 7 yards with a full load of #7 steel shot. The wound cavity was about a silver dollar-sized hole. He didn’t live long. After that, Steve recommended I let the birds get a bit further to avoid wrecking so much meat. Good thinking, Steve. After the first six we took a break to unload the birds. At that point I totally “got” why folks are so enthusiastic about upland game hunting. It’s exciting, fun, and the best part is you get to eat the product of your labor. Gary Williamson, one of the folks responsible for creating the bird preserve at the Big K, as well as my Blacktail guide tomorrow came down. He said, “So, what do you think?”, I replied, “Why Didn’t Anybody Tell Me About This Sooner!” which put a smile on their faces. After a few more birds, Steve invited Gary W to join us. Hunting birds with multiple people is interesting, the goal of course is not to shoot each other. Although Gary and I were never in danger, I “get” how Cheney shot someone while Quail hunting. Basically, you and your hunting partner are sometimes separated by 20-30 yards, often with intervening brush. You have your fields of fire, and need to trust your partner not to make a crossing shot at a so called “low flyer.” With Gary along for the ride we killed a few more pheasants for a total of eleven. I didn’t bother to weigh the resulting meat but my guess is, that out of 11 roosters, we got about 4 pounds of meat. It’s now in a cooler. Tomorrow night, Kathie will be cooking some up, using an old Kesterson family recipe. I’m excited. Wow you brainwashed a dog to help you take part in this barbaric activity? I don’t know what’s more cruel — killing the helpless birds or forcing another one of god’s innocent creatures to help you in your quest for blood. Actually, Steve did the brainwashing, I merely exploited the dog to serve my selfish needs for good eats. Very cool Brent. Now you have a reason to visit your cousins annually as Iowa and Nebraska have the best upland bird hunting in the country, that is unless you go hunting on a stocked preserve. Totally agree with Mountain Man. Also, I am not surprised to see violent video games mentioned (yes, the graphics may look “cute” but it’s still an animal murdering game). Never mind that guns and violent video games caused the Columbine High School Massacre. If God didn’t want you to eat pheasant, why did he make them out of meat??? Babies are made our of meat, would you eat babies? Nope. I hate the AARP too. But I thought we were talking about hunting?